Lahore : Hamza Shehbaz MNA has said that administration, police and all institutions should ensure best arrangements during Muharram-ul-Haram and foolproof security and all out facilities should be provided to the participants of the processions. Hamza Shahbaz said that in view of tension at borders, a watchful eye should be maintained on anti-peace elements and strict search and surveillance of the participants of the processions should be ensured. 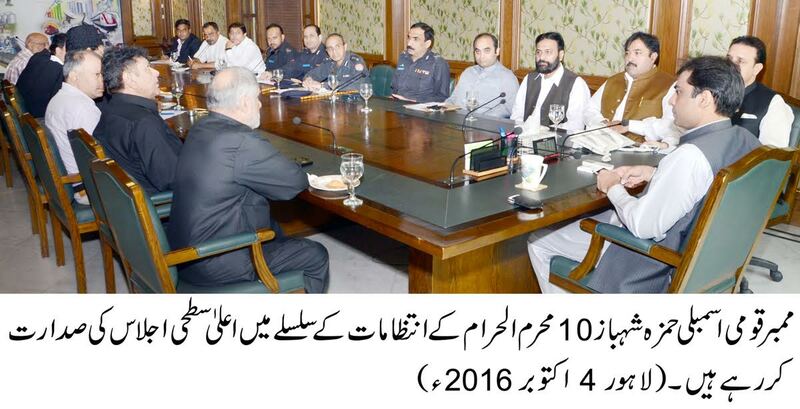 Similarly, all the departments should extend full cooperation for route of central procession of 10th Muharram-ul-Haram. He expressed these views while presiding over a high-level meeting, here today. Hamza Shahbaz said that Ashura is of equal importance and respect for all Muslim. He stressed upon the need to keep a vigilant eye on miscreants and promote love, brotherhood and religious harmony. He said that according to the instructions of Punjab Chief Minister Muhammad Shahbaz Sharif, administration and police should utilize all out resources for the monitoring of Ashura processions with modern cameras and concerned institutions should be taken on board for central procession of 9th and 10thMuharram-ul-Haram. He said that government will consider minimum loadshedding especially in evening up to 10th Muharram-ul-Haram. Similarly, WAPDA and PHA authorities should discharge their duties on the route of processions, he added. He said that announced constitution of a political committee for Ashura on behalf of Muslim League-N to monitor administrative affairs and mutual contacts on the matters relating to Ashura. Similarly, localbodies chairmen, vice chairmen and councilors will extend full cooperation to the procession of 10th Muharram-ul-Harram in their respective areas. DCO Lahore, CCPO, DIG Operations and Chief Traffic Officer while giving briefing with regard to Ashura arrangements assured that Ashura will also observed peacefully this year in accordance with the directions of Chief Minister Punjab. Agha Shah Hussain, Kh. Basharat Hussain, Kh. Maisam Abbas, Tauqeer Baba, Allama Mushtaq Hussain Jaffari and Hafiz Qasim Raza Naqvi appreciated the cooperation being extended by Punjab government especially district administration and police of Lahore. They expressed satisfaction over the arrangements and said that we all have to fulfill our responsibilities for the promotion of solidarity and stability of the country. Waseem Qadir, Syed Tauseef Shah and Kabir Taaj on behalf of Muslim League-N assured that all arrangements are complete at local level, peace committees are playing their effective role and all necessary affairs are being settled with mutual consultation.